I'm up late because I'm supposed to be working on a piece for this weekly newspaper on the East coast. So, instead of working, I've decided to write a post here. How's that for productivity? I've got standards, I tell ya. It's been a little quiet around here on The Ward-O-Matic only because it's been a hectic summer. After a three-week hiatus, visiting Florida, Atlanta, and Illinois, the Jenkins clan hasn't stopped once since we've been back in the great NW. And school's going to start soon, making it even busier for us around here. In the meantime, I've been working full-time at Fashionbuddha, in downtown Portland, working on a project that needs a great deal of hand-drawn assets done by me. It's an interesting project, but one that has a crazy turnaround time. When have I ever worked on something that didn't have a lighting-fast deadline? It's the nature of the business, I'm afraid. So, while I've been working throughout the day, Andrea's been getting ready for Squam, teaching a couple of classes on Through The Viewfinder, or TtV, for short. Each day has been filled with ordering things, organizing, getting prepared, etc. Not to mention, the kids need to get fed. Okay, so when do we get another vacation. Like, now? While in Illinois earlier this month, Andrea and I got to visit a good number of thrift stores and antique shops with her mother, Ava & Ezra in tow. Above, you can see my haul from the trip. I actually found a way to pack all of that in my various luggage pieces for the trip back home. I'm still reeling from that travel day, by the way. It was NOT the best trip I've taken on a plane at ALL. Maybe that's a story for another day. Easter eggs are a staple in today's modern entertainment. 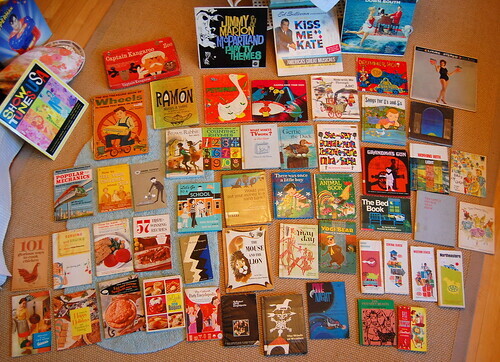 Whether it be animated films, cartoons, DVD special features,...and yes, even children's books. I'm sure you're quite aware of the multitude of easter eggs found in Pixar's films, as well as the vast majority of hidden gags in Looney Tunes throughout the years. I, myself, have snuck in countless inside jokes in almost all of my work since I've been working in the industry. Check out this ID for Animania and see if you can find me: Animania Superhero ID. Why do we do this? Boredom. Either that, or it's just a lot of fun. 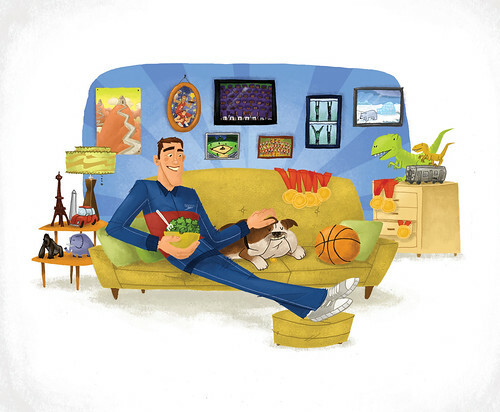 Being an animator, it was almost inevitable that I would somehow slip a couple of inside jokes into the first children's book I illustrated, How To Train With a T. Rex and Win 8 Gold Medals. Some are obvious. Others, not so much. I knew that it would make it fun for my friends and family to read through the book to see something familiar. An extra connection that I knew would be enjoyable for my loved ones. Say, what's the name of that pizza delivery service? Ah, yes. 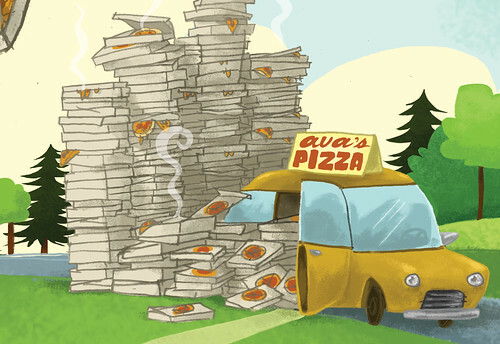 Ava's Pizza, named after my daughter. She loved seeing this. Say, what's the name of that broccoli delivery service? Ezra's the name of my son, of course. He did NOT like this at first. He thought that old guy was him and got all grumpy about it. I reassured him that it wasn't him, but the truck driver. 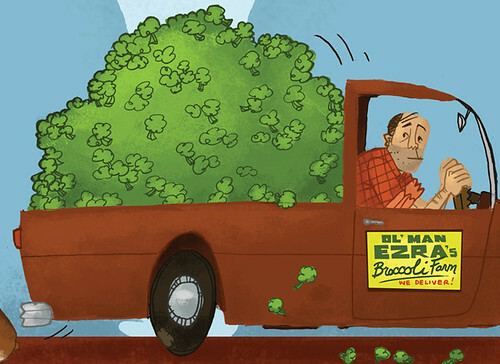 "See, you hire him to do the delivery of all the broccoli!" That seemed to work. He likes seeing his name in the book now. And the "Ol' Man" bit was something I took from one of Ezra's sayings. He would call us "ol' man!" every once in a while. He's quite the entertaining fellow, that Ezra. This was a dozy of a page. With the deadline looming, I knew it would be crazy to work on all the details of the basketball players, so I tried a simple approach at first. It didn't work out. I just had to face the music and create each and every one of these guys with all the different colors and line colors and shading, etc. It was crazy. But worth it. Say, doesn't that look like some artist/animator you might know? Couldn't resist putting myself in this. Just too easy. I'm the only guy wearing purple and red: my little homage to Prince. The bald guy right next to me is my brother in law, Von. Two above him, with the full beard and wearing purple and white (for the school he went to in Cincinnati) is my other brother in law, Nate. Directly above him in the fu manchu mustache is their father, my father in law, Jim Corrona. Otherwise known as "Coach". I drew him as he looked in the late 70's, when he was the head basketball coach at Salem High School, Salem, Illinois. Their school colors were dark green and white. 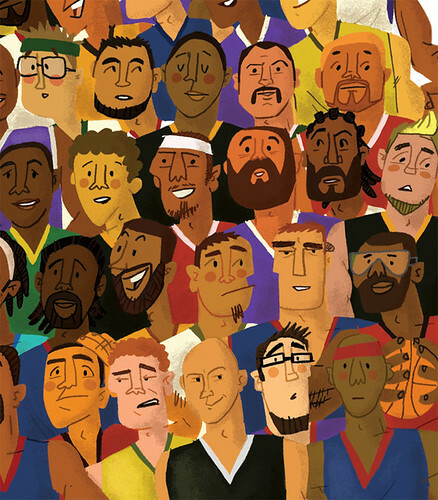 The rest are just various faces and people culled from various sources, mostly from NBA team sites. Some are actual players, but I wouldn't know what their names are for the life of me. It's always fun to turn the book on its side, right? This spread gave me fits! I couldn't for the life of me work out a decent concept for the text. That is, until I decided to make it vertical. Violá! The hikers on the left are loosely based on me and Andrea when we went to Italy back in '99. A stretch, I know, but that was what I was thinking of when I started to draw this couple. 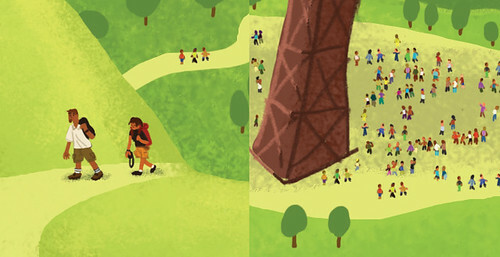 Why am I showing a close up of all the little people underneath the Eiffel Tower(s)? My daughter, Ava, helped out with the coloring of some of them! I showed her how to work the stylus and Wacom tablet in Photoshop and let her go to town. She had a LOT of fun with this. She's very proud of her work. 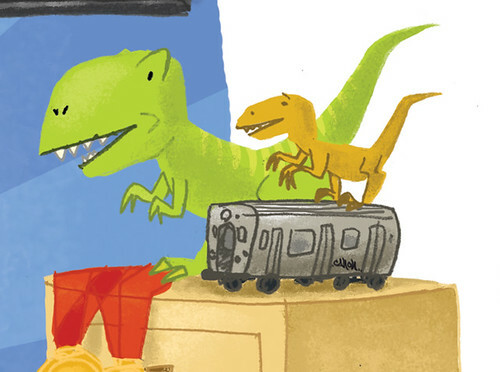 If you put a subway car in a children's book, I'm bound to bomb it with a tag: CANON. Okay! How's that for your Monday? Hope you enjoyed this little tour of easter eggs found in my book. Never sure if I'll ever have a chance to do this, but it's always a thrill when I do have the opportunity. Makes it all the more special for the readers, I hope. 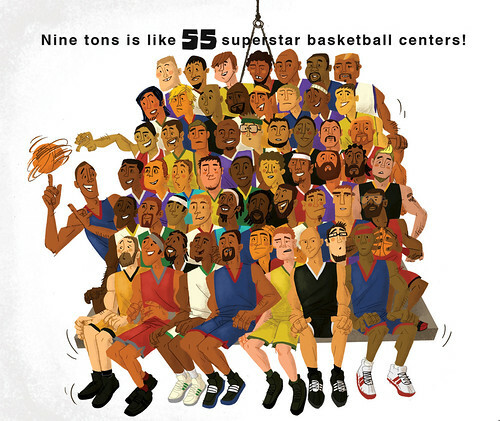 If you haven't checked the book out, I hope this might encourage you to buy the book solely for the sake of impressing your little ones that you know who Ava and Ezra are, and know that the illustrator can be found on that one page filled with basketball centers. Who knows, it just might work.